We all have unexpected guests at some time or the other. A friend dropping in to say hello, the husband who invites his buddies for a drink or just your kid’s friends for their usual hangout at your place. The first reaction is to go into panic mode and wonder what you are going to serve them to eat? Well here is something that you could put together fairly easily. Chicken breast meat is something one usually has in the freezer and this comes to good use in this recipe. 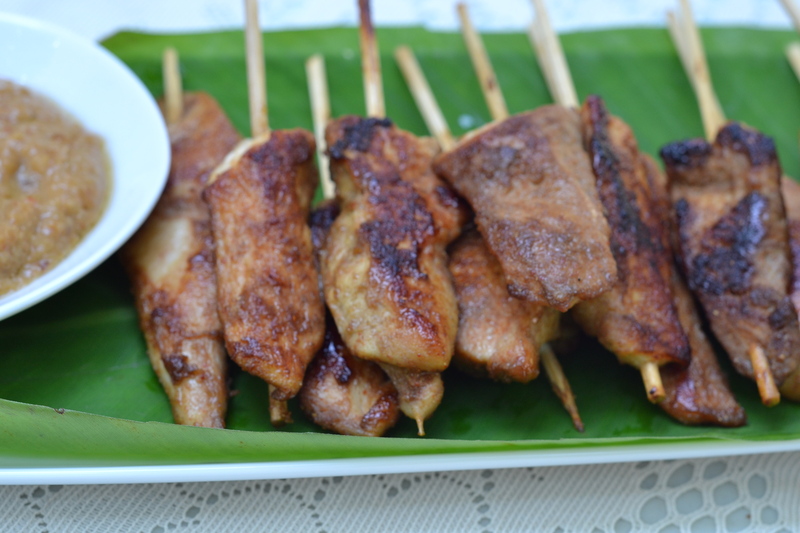 These Malaysian Satay sticks are rife with flavors of Soy, brown sugar and spices .Chicken satay is very popular as street food in Malaysia & Singapore. Most often eaten as an appetizer or you may even choose to serve these as a part of your main meal. We made these for the Adult appetizer workshop @ Cookingwithshy last week. And of course satay is never complete without a nutty and flavorful peanut sauce. Go ahead and follow this recipe and your guest’s won’t be disappointed. Cut the chicken into thin 1 inch strips. Blend the onion in a food processor. Add the rest of the ingredients to the onions and blend well. Marinate the chicken in the above mixture for at least half an hour. Add a little bit of sesame oil to a pan and heat it. Serve as a starter with Peanut sauce. Grind the peanuts in a food processor and keep aside. Blend all the ingredients under spice paste. Heat a little oil in a pan and fry the spice paste for a few minutes. Add in the ground peanuts, water, soy sauce and sugar and stir well. Simmer for about 2-3 minutes or until the sauce is smooth in consistency. For a tangy flavor add juice of half a lemon and mix well. It was great to finally meet you Shy! I’m glad I passed by yesterday to meet everyone! I better try it soon!